Welcome to Google Guide, an online tutorial making searching even easier. Google is so easy to use, why take this online tutorial? If you're like many people, you use only a small number of Google's services and features. The more you know about how Google works, its features and capabilities, the better it can serve your needs. If you have time, read all of Google Guide and work through the examples and exercises. Otherwise, look at the Table of Contents or use the search box at the bottom of each page to find the pages or sections that are likely to be most helpful to you. Try the examples, work the exercises, and click on the links (usually underlined) to see Google in action and to learn more about a topic. Since the web and Google's algorithms and features constantly evolve, your results may be different from those shown in this tutorial. Pointing to any link (press the TAB key to jump to the next link on the page). Holding down the SHIFT key while you click on the link (if you use Internet Explorer). Pressing the right button of your mouse, and then selecting "Open a New Window" (or the middle button if you use Mozilla or Netscape). After viewing the results, close the window and you will return to the tutorial. On Microsoft Windows, you can kill the top window by pressing the ALT and F4 keys simultaneously. You can switch the active window by pressing the ALT and TAB keys simultaneously. Although this tutorial is for people new to Google, it contains information of interest to those who have experience with Google or another search engine. Unless you're familiar with all of Google's features, you'll learn something by taking this tutorial. Who will Benefit from Google Guide? Practically anyone who uses Google. How Much Time Will the Google Guide Tutorial Take? This online Google tutorial will occupy you from 0.5 to 8 hours, depending on how many sections you elect to skip, and how many of the examples and problems you work through. Most people spend about half an hour at a time, and two hours total. Near the top of each page is a navigation bar. The current section and its subsections are displayed in blue. Click on any name in the navigation bar to be taken to the corresponding section. If you want to restrict your search to just pages on Google Guide's web site, follow your query with site:www.googleguide.com. Why the Name Google ~Guide? Why did I first name this tutorial Google ~Guide? Putting a tilde in front of a search term (with no space in between) effectively turns that term into any of its synonyms. The tilde is known as synonym operator. So, if you search for "Google ~Guide," Google will find Google Guide as well as other Google tutorials. Jerry Peek, author of Unix Power Tools, gave me the idea of writing a book about using Google. I found the idea appealing because I was a fan of Google, was interested in learning how to use it better, there were no other books about Google when I started writing, and with such a job, I could work flexible hours. I created Google Guide and gave seminars on searching with Google to get feedback from users. How is Google Guide Different from How to Do Everything with Google? The book How to Do Everything with Google covers material similar to Google Guide, but it's a reference book while Google Guide is a tutorial, with exercises at the end of nearly every section. 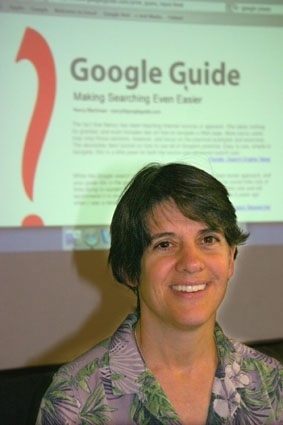 To get ideas of what to include in Google Guide, Nancy Blachman gives free seminars on searching with Google. Nancy has been using Google since the spring of 1999, when Google was less than one year old. She has written over a half dozen tutorial and reference books, including How to Do Everything with Google, Mathematica: A Practical Approach, Mathematica Graphics Guidebook, Mathematica Quick Reference, Maple V Quick Reference, and Putting Your Heart Online. Nancy is president and founder of Variable Symbols, a company that specializes in software training and consulting. Nancy obtained a B.Sc. in Applied Mathematics from the University of Birmingham, U.K., an M.S. in Operations Research from the University of California at Berkeley, and an M.S. in Computer Science from Stanford University, where she taught for eight years. Jerry Peek is author/co-author of seven books; he's been a technical writer, instructor, and course developer for more than twenty years. Jerry has a B.S. in Electronic Engineering Technology from California Polytechnic State University and an M.Sc. in Computer Science from the University of London, Birkbeck College. He currently writes the Power Tools column in Linux Magazine. If you want to meet the authors, consider attending Nancy's birthday party/conference. This page was last modified on Thursday July 20, 2006. For Google tips, tricks, & how Google works, visit Google Guide at www.GoogleGuide.com. & create derivative works, visit Google Guide's Creative Commons License webpage.